Welcome to the Baxtorian Falls area! It can be found to the west of the Seers' Village and plays a big role in the Waterfall Quest. The main attraction of the falls area is the Waterfall Dungeon, which will be explained further in the Waterfall guide. As said before, the Waterfall Dungeon is the main attraction of the Baxtorian Falls. To get to the dungeon, head to Almera's house at the northern part of the map and board the raft behind the house. You will crash on a small piece of land. Now use a rope with the rock further down the river, and then use the rope with a dead tree to lower yourself onto a ledge. You need to be wearing Glarial's Amulet to get inside. What few people know is that there are actually two Waterfalls. 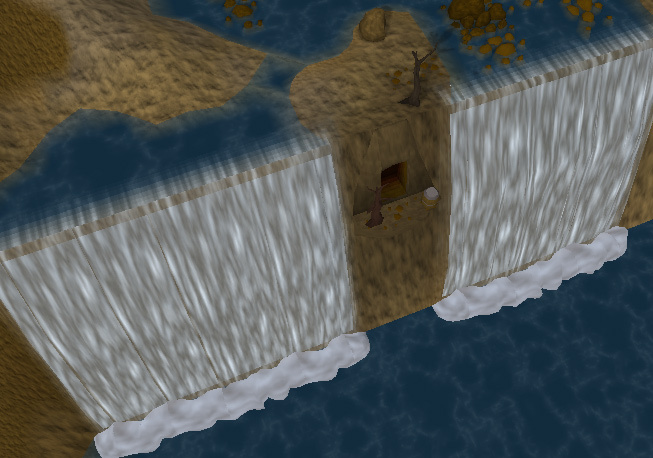 The one that the Waterfall Dungeon is on is often full and many people visit, but there is also a second Waterfall. Where the water that supplies both these waterfalls comes from nobody knows, but what is a fact is that it is a long drop off the side. On the west side of the lake lives Otto. He can teach you additions to the skills that are "barbaric in origin." The skills he adds to include Firemaking, Fishing, Herblore, and Smithing. In the Firemaking skill, he teaches you how to start a fire without a tinderbox. In the Fishing skill, he teaches you how to harpoon fish without a harpoon. 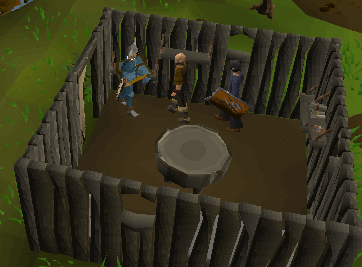 He teaches you how to extract some fish parts to improve some potions for the Herblore skill. Finally, in the Smithing skill he can teach you how to make the traditional barbarian hasta - a one-handed spear. Right in the heart of the Baxtorian Falls Area is Glarial's Tomb. To enter, you cannot be wielding any Weapons or Armour (includes Runes). 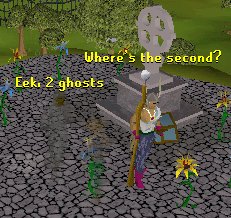 The first Ghost in the Ghost Robes Mini-Quest can be found beside the Entrance as well if you are wearing the Ring of Visibility, but if you aren't wearing the Ring you cannot see it. Within the picnic area is the entrance to the Invisible Dungeon in which you kill Damis during the Desert Treasure Quest. Again you can only see it if you are wearing a Ring of Visibility. You cannot stand on the square that the ladder is whether you are wearing the Ring or not. 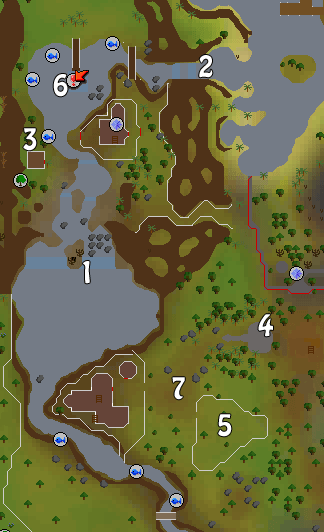 You must have completed the first Firemaking task (the one where you light logs without a tinderbox) to gain access to the Cavern. 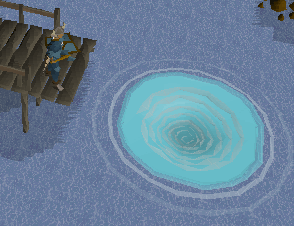 Once you dive into the whirlpool entrance, you cannot leave by that way. To escape, you must find a log in the water that you can ride out of the Cavern on. This dungeon is very dangerous, with the weakest monster a level 115. This is also the dungeon that the Mithril Dragons live in. They are level 304 and will occasionally drop a dragon full helm. Rasolo is a Wandering Merchant that sells things for more than they would cost if you bought them from the proper shop. It automatically stocks 1 of each item. He also gives you the Ring of Visibility and you can get another one off him if you lose your first one.